CHARITY, service and fellowship are important objectives of all Rotary clubs. In the space of just four days Henley Rotary Club worked hard to achieve those objectives. On the morning of Sunday, October 7. members assisted the Henley Hawks at their Kids First and juniors festival of rugby in which some 1,700 children took part. 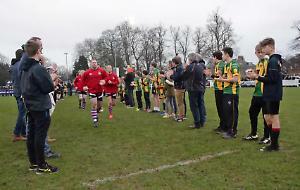 In the morning, we provided stewards to assist the constant stream of vehicles entering Borlase Field for parking while at the same time helping the many players, parents and spectators to cross the busy Marlow Road safely. The operation was reversed in the afternoon as the return journey was made across an even busier Marlow Road and hundreds of vehicles jockeyed to leave the car park to return home. On Monday, October 8, club president Peter Thomson and president-elect Barry Prior visited the headquarters of the Thames Valley Air Ambulance to present a £1,000 cheque to Clare Allen, the charity’s event manager. The money was raised by the club’s charity auction and jazz concert held earlier in the year. The presentation was timed to recognise that on October 1 the charity became a fully accredited independent healthcare provider. Amanda McLean, the charity’s chief executive, said this would not have been possible without the tremendous support from the local community. The accreditation will allow the team to provide at least an extra 14 hours of critical care response every day. The club prides itself on combining a lively social programme for its members with organising charitable events and community service. On Friday, October 5, members visited Blenheim Palace to receive a very informative and entertaining talk on the history of the Marlborough family and the palace. The talk was followed by a conducted tour and in turn by an excellent Chinese buffet lunch. The party then enjoyed visiting the palace parkland and gardens in the afternoon. A very full and enjoyable day. If taking part in such activities appeals to you and you would like to consider joining the club, please email the secretary Phil Fletcher on phil.fletcher@btinternet.com to arrange to come along to a meeting as a visitor and make some new friends while at the same time assisting charities and the community.